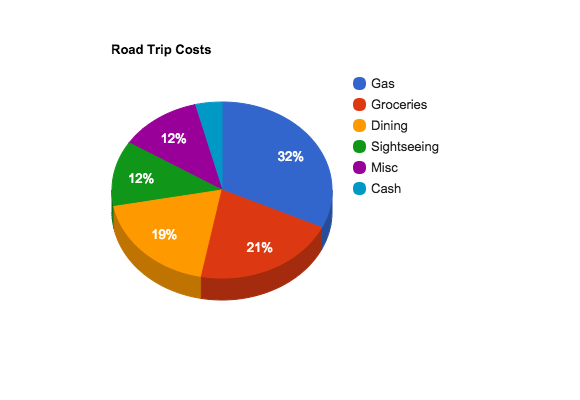 How Much Did That 11.5-Week Road Trip Cost? I’ve said many times that traveling is much cheaper than living in San Francisco. Southeast Asia and most of South America are obviously easier to budget for, but I’ve discovered that even road-tripping around the U.S. is significantly cheaper than living in San Francisco too. Last year when we spent 3.5 months on the road driving from San Francisco to New York and down to New Orleans and back, I compared domestic travel with international travel and laid out tips for RV-living. This year, I decided to keep track of all my spending over the course of 11.5 weeks because I was curious about where my money went. How much does a couple months of road tripping around the U.S. cost? What percentage of my expenditures go toward gas? Food? Our goal is to not travel in the cheapest way possible, but to simply be comfortable. Even though we weren’t quite frugal with our spending, I was content with the final numbers. Before I dive into the data, here are some important details. 1. We own a 16′ trailer named Scromp. Scromp has everything we need–bed, kitchen, heater, shower, toilet, hot water heater, solar power, the whole deal. My budget does not include accommodation, since our home is our trailer. We don’t like the idea of paying $30/night to camp. 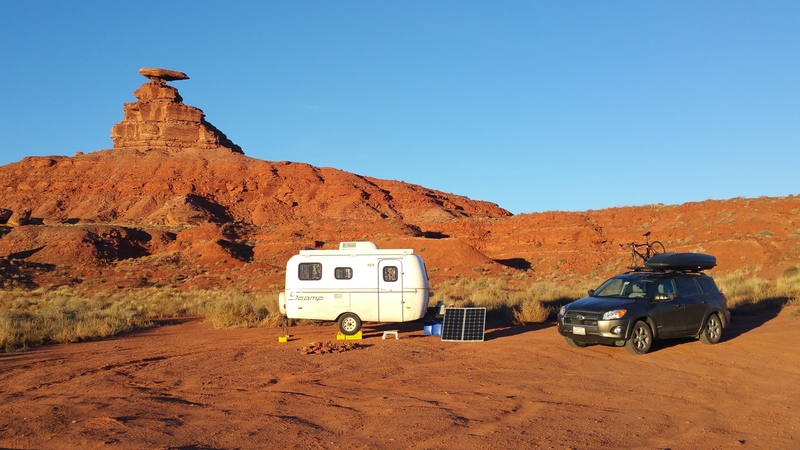 Instead, we love to boondock, which means self-contained, dispersed (free) camping, typically on BLM land, Forest Service Roads, and free campgrounds. 2. 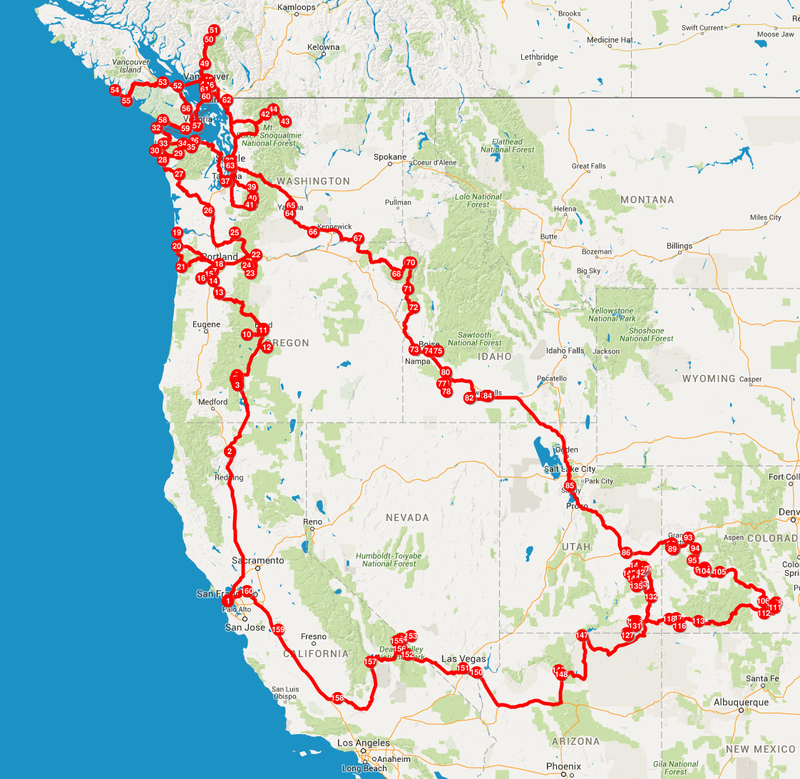 We stuck to the West: the Pacific Northwest and the Southwest. Our first half of the trip was dedicated to the Pacific Northwest: Oregon, Washington, and a bit of British Columbia. We bugged out of the Pacific Northwest before the weather could get too nasty and spent the remaining half of our trip in the Southwest: first Idaho, then Utah, Colorado, and Arizona. We totaled ~9,500 miles. 3. We always travel during the low season. This entails more free campgrounds and generally lower prices on everything (gas, food, admission fees, etc.) We traveled from September 18, 2015 through December 9, 2015. 4. Because we didn’t have to budget accommodation, our biggest expense was food. When our expenses for groceries and dining out are combined, food takes up 40% of our total spending. That breaks down to $11.45/day/person for 3 meals and snacks. I tried to cook as much as possible, but we weren’t going to pass up on one-of-a-kind restaurants in Portland, Seattle, and Vancouver. Still, I was thrilled to keep the number down to almost half the amount the average American spends on food per week. 5. Gas prices were at an all-time low, ranging from $2.05/gallon to $2.80/gallon. Gas in Canada was more expensive, but we spent less than 2 weeks in Canada. We were lucky that gas was at an all-time low because gas and propane was our 2nd biggest expense at 32%. Keep in mind propane is used for heating, cooking, and the fridge. It got COLD at times–the coldest being 10ºF at night at the Grand Canyon in December. Needless to say we spent a bit more than expected on propane, as little as $15 every 2 weeks early on in the trip to almost $20 every week the last month of the trip. Brrr! 6. My budget does not include data/cell-phone plans and insurance. We paid ~$205/month for 2 smartphone plans and a hotspot line with 20 gigs of shared data. Chris worked as we traveled so the data was a necessity, but fortunately a company write-off. 7. My budget does not include alcoholic beverages because I don’t drink. Chris spent money on beer and wine, which he purchased on his own and kept separate from my expenditures. My assumption is if you always have beer or wine with dinner, then the cost of food should be 50-75% higher than what I have listed. 8. My budget is for 2 adults. I am 30 and Chris is 37. Considering I’m below average in size for the average American, assume I don’t eat a whole lot. Now for the fun useful stuff. Remember this is for 2 adults over 82 days. Dining Out restaurants, cafes, fast food, bakeries, etc. To see the entire itemized list, you can download my spreadsheet here. To keep the number clean and easy, let’s say the trip cost $30 per person per day. That’s $900/month/person for a home, gas, food, supplies, epic hikes at numerous national and state parks, incredible adventures, and one hell of a memorable journey. Well, that sure beats the San Francisco $2,500+ month lifestyle of rush hour traffic and 8 to 12-hour work days 5 days per week just to keep life on the grind! The only way to make this possible is to not have debt and save as much money as possible, as outlined in this post. For 5 months in Southeast Asia, Hong Kong, and Japan in 2014 we ended up spending roughly $1,200/month/person, which included international airfare and multiple international bus rides. For 5+ months in Latin America in 2015 we ended up spending roughly $2,380/month/person, which included trips to Easter Island and the Galapagos Islands. Even before arriving to Latin America, I assumed I would spend double than my Southeast Asia budget and I ended up being spot on! I honestly had no idea how much we would end up spending on a road trip around the U.S., but I knew it wouldn’t be too bad considering we had Scromp and I cooked most of the time. All in all, $30/day cannot be beat. We have so many more years of road tripping in the U.S. to look forward to, and I can’t wait! This entry was posted in Uncategorized and tagged budgeting, roadtrip. Bookmark the permalink. 2 Responses to How Much Did That 11.5-Week Road Trip Cost? Love your post! It puts traveling into perspective. My boyfriend and I just moved from Maryland to New Zealand a couple of months ago, and then in a few months we will be moving to San Francisco. This is our first time living together so we’re still trying to master our budgeting methods. I LOVE your type A organization skills. Looks like a fun trip! I find that sharing budgets helps other people realize their goals. People are interested in the blog posts about money for obvious reasons. Hopefully you guys keep track of your $ too. Enjoy your journey!